How will this help my exceptional learners? 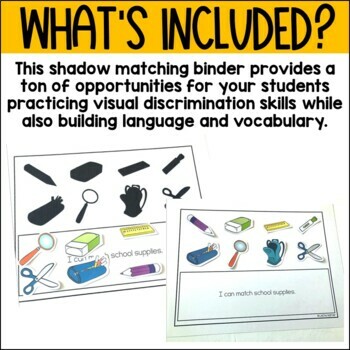 This set provides you with more than twenty themed work pages that provides practice and support in building vocabulary and mastering visual discrimination skills. Please see the preview for a look at how this activity is designed. This set can be used as daily work, small group work, whole group work, independent or 1:1 work, homework and more! It is recommended that you print on card stock for durability, laminate and Velcro. 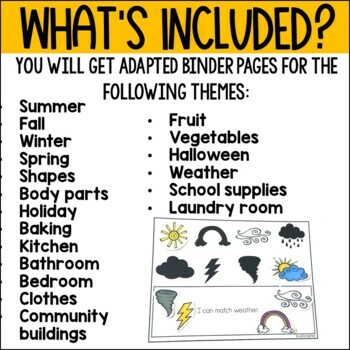 Store in a 3 ring binder. 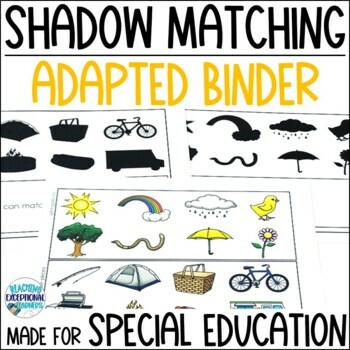 I teach in a self-contained classroom and I purchase or make a lot for my students in order to have individualized materials to meet the needs of each student. Creating things for my students has become a passion of mine and I truly love sharing my work to help others. If you like what you see, want updates on new and free products, go ahead and click "FOLLOW" to stay up to date on everything in my store! Want to earn free credits to get future products at a reduced price or NO COST? Simply leave feedback on this product, or any purchased products you have made. This will allow you to earn credits towards future purchases! 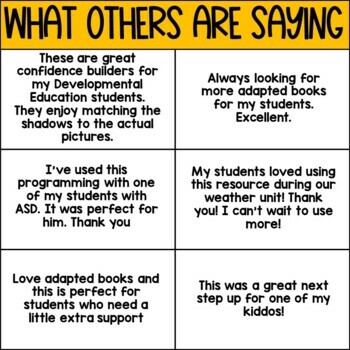 Thank you again, I hope you and your students enjoy this product!